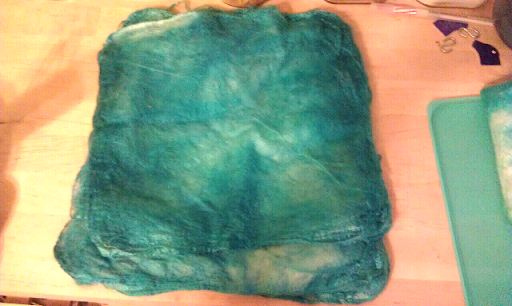 I enjoyed spinning silk hankies so much that I had to give dyeing them a chance. 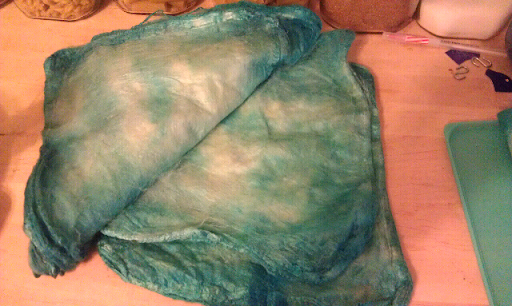 This was my first time ever dyeing silk, and I wanted to make sure to do it properly. I had read that if you heat silk too much it will lose its luster, so for the first time I did my dyeing in the oven where I could have more control over the temperature. While I was filming this video, I worked on dyeing a second batch of silk. This batch contained 1 ⅛ oz (31 g) of silk. 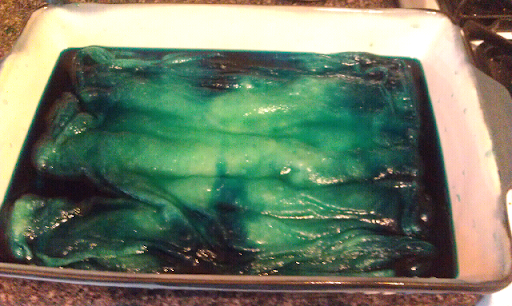 I presoaked until translucent, and added 60 drops blue, 4 drops green. 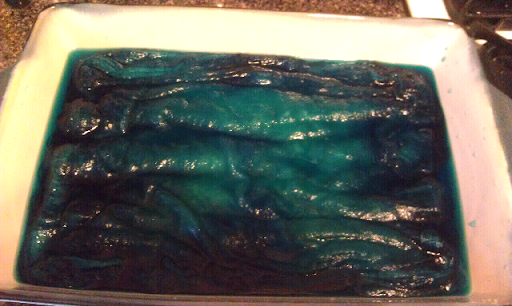 I let the silk sit in the dye for a while before placing it in the oven at 175 F (120 C). I was hoping to achieve a blue deep enough to go well with the other silk hankies I had spun. Although the water ran clear, there is still not quite the depth of color I was hoping for. I have two choices. I can just use this silk as is once it has been spun (and purchase some more of the hanks in the hood fiber), or I can over dye it after it has been spun until I have reached a color saturation that I am happy with. Either way, I know that I am in for a lot of fun! I am very tempted to leave this color the way it is. There is such a depth to the blues once I have started spinning it (form the variation of shade plus the luster of silk) that the yarn is very inviting. Pretty colors. What do you do with the hankies? Spin them into yarn! Each hankie is made up of many layers, each comes from an individual silk worm cocoon and gets stretched over a frame to give the square shape. In my next post, I'll share my video for how to draft them to use for spinning or to knit directly from the drafted fiber.